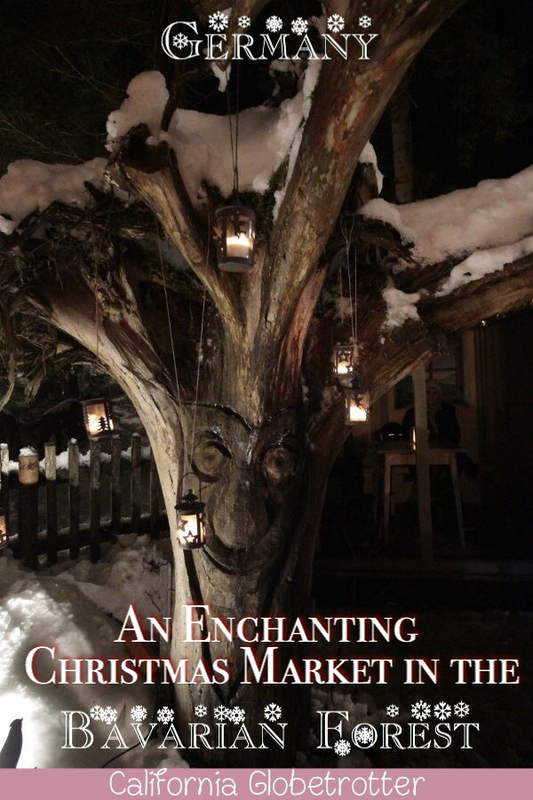 Want to experience an enchanting Christmas Market? PIN IT FOR LATER!! Where: Just an hour east of Regensburg, close to the border with the Czech Republic is the Bavarian Forest which continues into the Bohemian Forest. The Bavarian Forest was designated a national park in 1970, a first for Germany and is today one of the largest protected forests in central Europe. 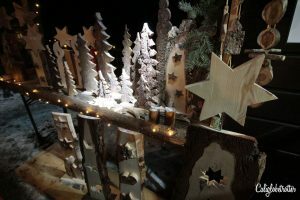 In the heart of the Bavarian Forest is the small town of Regen whose small district of Schweinhütt puts on the most enchanting Christmas Market in Bavaria. 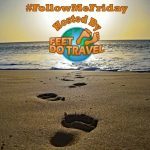 Friends, family and loyal blog readers often ask how I find all of these charming cities and towns I so often write about that are practically unheard of, to which I always reply, “From Instagram or Pinterest”. I have a natural knack for finding the cutest, most magical towns off the radar because I enjoy the simple pleasure of going where not all may wander. 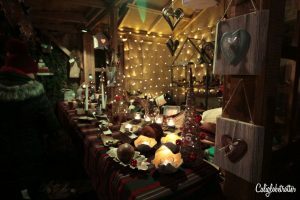 But, before I share with you this bewitching Christmas Market, I’ll share with you how I found it. Recently, the mother of a student of mine gave me an early Christmas gift. Knowing that my stepmom would me gracing me with a visit for Thanksgiving, just in time for the opening of the Christmas Market season, she knew that this particular gift would come in handy. 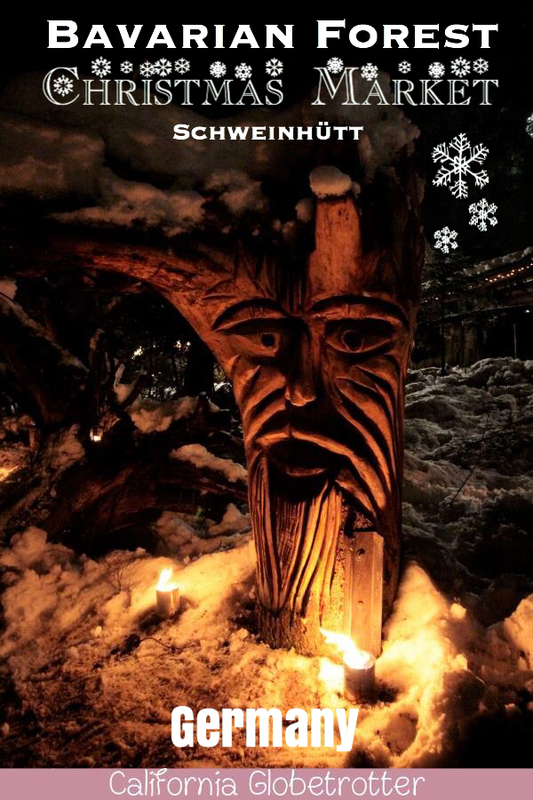 A magazine,Weihnachtsmarkt Magazin 2018, with over 700 markets in Germany. I was ecstatic with Christmas joy as I got home and plopped down on the couch in search of a new market to visit. Low and behold, just a tiny little blip of the Schweinhütter Waldweihnacht in the lower left hand corner with a small picture immediately bewitched me and I knew I had to go. I knew not what to expect nor how big it would be. I didn’t care. I simply knew I had to go. And so, with two friends, my husband and I all bundled up from head to toe in winter gear, we set out on our journey, and were immediately spellbound by its charm. When: December 8th & 9th, 15th and 16th, 2018 from 2:00pm – 9:00pm. Entrance fee 3 € for adults and children under 16 are free! St. Nikolaus comes by at 4pm every day to read fairy tale stories to young and old, big and small, and in the evenings, at the theater in the main market, a Christmasy theater will engulf you into a fascinating Christmas story at 5pm while the more brave of heart can watch a thrilling performance at 7pm by the a group of Krampus, „d’Woid Krampal“ at the open air theater, a traditional part of German Christmas Markets in Southern Germany. Get there early if you want seats or risk jumping up and down to try to sneak a peak. 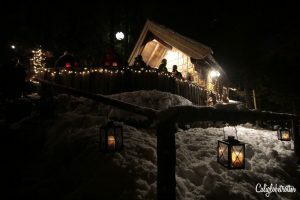 What to expect: Deep within the forest, you can expect a couple of feet of white, fluffy snow covering rooftops of huts and stretching as far as the eye can see clearly making it one of the most interesting Christmas Markets in Bavaria. 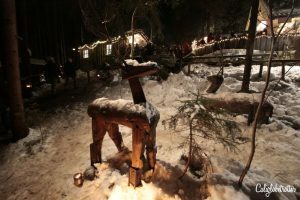 A magical Christmas Market unlike any other, small huts decorated with pine tree branches and twinkling lights are scattered throughout the forest. 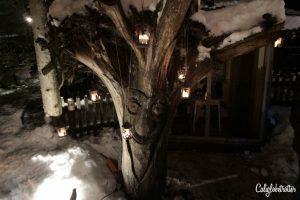 Hundreds of candle lanterns illuminate the snowy pathway as you wind your way through the forest, stopping at each hut to gander at the handmade artisan knickknacks and enjoying the occasional glass of steaming, hot Glühwein to stay warm. 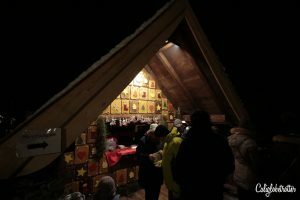 The sweet, sweet aroma of fresh gingerbread cookies and sweets wafts through the air from the direction of the cutest Gingerbread House stand with a line of hungry market goers. 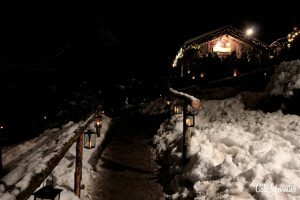 Blazing hot fire pits are scattered throughout the forest and within small huts allow us mere mortals to absorb the heat back into our frozen fingers and toes before mushing on, trenching through the cold to the next Glühwein stand. Nothing can make the winter more enjoyable than the smell of a wood burning stove which brings back childhood memories. Who will be there? 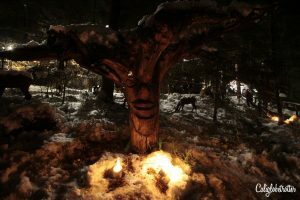 : Mysterious wood carved trees with facial expressions bring to life this enchanted forest while the occasional Wichtel (gnomes) plays tricks on unassuming visitors by snatching their beanies and poking them in the bellies. With rather large noses, and big bushy eye brows and ridiculously long mustaches, the gnomes are seen meandering hither and tither through the market, causing a silent raucous and bringing laughter to the evening night before dashing into the darkness once again only to reappear and prank another forest visitor sparking unsolicited laughter! 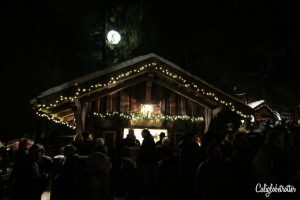 A bright moon hovers over the market to illuminate the night and Christmasy Bavarian Brass music echoes through the night while friends and family gather to do their holiday shopping or to commune together around the fire. 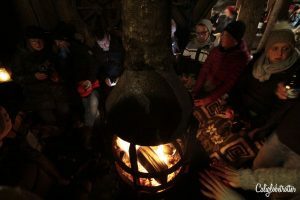 We filled ourselves up on sausage sandwiches and freshly made potato chips and drank our weight in Glühwein before we found a comfy and cozy fire to warm up by, with a blanket spread across our laps. 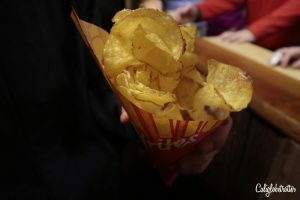 We sat and enjoyed the crisp night air nipping at our noses and a kind Bavarian chap offered us a shot of some homemade Schnapps, patiently waiting to giggle at our contorted facial expressions, knowing full well us measly foreigners would cough in surprise before making small talk from where we originated from. With such a thick Bavarian dialect, we could do no more than simply look doe-eyed and laugh at whatever it was the gentleman said. Clearly, one of the most untouristy Christmas Markets in Germany as this was a market for locals and the occasional tourist. 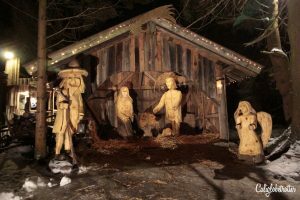 We wound our way back up through the market, stopping to admire the wood carved nativity scene before making our way back to the car, but first not without stopping at yet another large fire. And just as we were leaving, soft white snow began to fall. 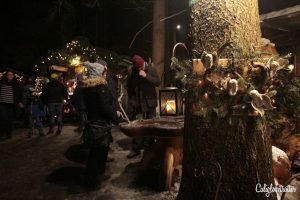 Named one of the Top 10 Most Beautiful Christmas Markets in Germany in 2016 by GEO-Magazin, with forest ghosts and gnomes running through the shrubbery, I thought to myself, I couldn’t possibly agree more! The following Magazine I received as a gift and now comes highly recommended to you and your Christmas Market addiction. With over 700 markets to chose from, you’ll be able to plan and visit as many markets as you can possibly squeeze in! 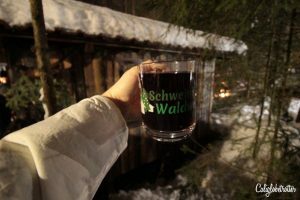 We live in the tropics at the moment, but how I would enjoy Glühwein right now! 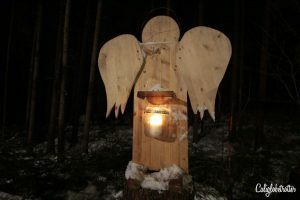 Thanks for sharing the great photos, I hope to experience the Bavarian forest during the European winter. It’s as magical as it gets! Hope you get the chance one day! Uh, I’d say in Germany, I’ve been to around 10-15, with a new one this weekend! I had never heard of Schweinhütter Waldweihnacht. It looks so cool and now I want to go. I might be a little biased but Bavarian Christmas markets are the best. Christmas in Germany is just magical. What a magical looking place and fun adventure! Thank you for sharing this with us. 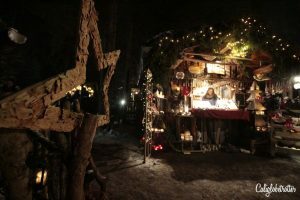 I can only imagine how enchanting this Christmas Market in the middle of the Bohemian Forest must be. I don’t get to see too many European Christmas Markets because we usually like to stay home for the Holidays. However, some years ago I’ve spent Christmas with my cousin in Munich and I will never forget how inviting the Christmas Market in Marienplatz was. The one in Regen however seems to be quite special. 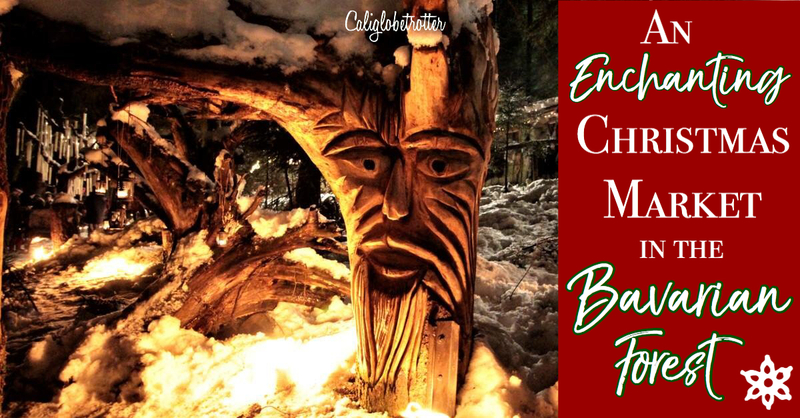 You don’t see wood carved trees with facial expressions in other Christmas Markets. Now – you know I love a good Christmas market and feel like they are straight out of fairy tales, but THIS. THIS is next level fairy tale!!! I love the carved trees. What an incredible adventure. You know I’ll be finding that magazine, too. What a thoughtful gift! What most intrigues me is all the snow! On the roof, everywhere. I would love to experience a “white Christmas” sometime! This looks like the setting of a fairy tail. Happy holidays to you! I really do admire your knack for finding charming towns. 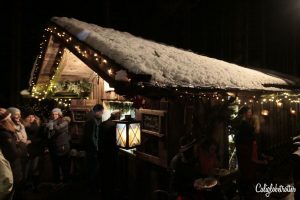 You’re so lucky to enjoy these various Christmas markets and this one is such a great find especially since it’s not on the tourist trail. I love the idea of some fun with the trees and gnomes. 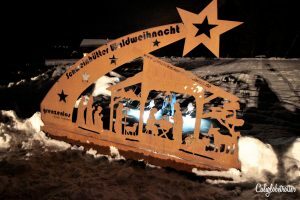 Visiting these Christmas markets in Germany is still high on the travel wish list. What a wondeful place to celebrate the Christmas Season! I can almost smell the gingermbread and smoke from wood fires; your words and photos bring it all alive. I’d love this one, since it seems less touristy than what I would expect. Thanks for sharing; have a great Holiday season! 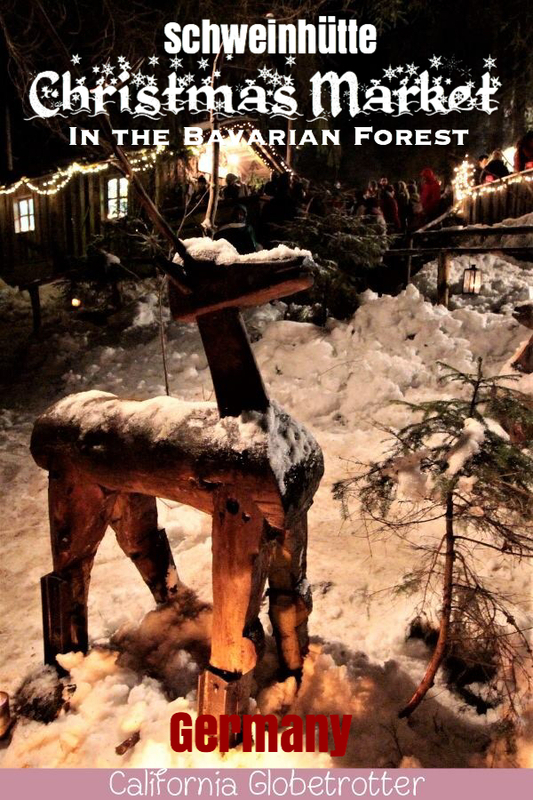 Woohoo, this takes Christmas markets to another level. 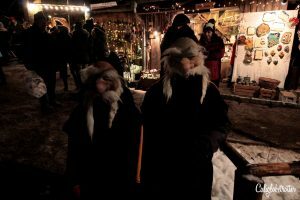 We love visiting the Germany at Christmas and this is certainly something a bit different. It almost comes a across as a bit spooky. This looks like such a fun and different Christmas market. I love how spooky and eerie it is with the dark forest and carved trees. I heard of similar folklore regarding gnome-like creatures just across the border in the Czech Republic. Fun! I mean – does it get more Christmasy and magical than this?! I just love all the German Christmas markets I read about and wish we had them in the U.S. (the ones in the U.S. aren’t nearly as whimsical). Sounds like you found a real local one too which is great. 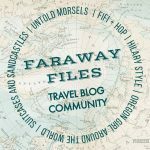 Merry Christmas and thanks for linking up with #farawayfiles !